It’s Applied Digital Skills Week Day 2 and we’re just getting started! Today we’re exploring Google’s Applied Digital Skills curriculum to see what kinds of projects you can do with your students. Take a few minutes and explore the lessons available in the Applied Digital Skills curriculum. Find one that meets the needs of your students. How to enter challenge #2: Share a link to an Applied Digital Skills lesson and tell us how it will help your students (of any age!). Include what and who you teach! Share on Twitter, Facebook or Instagram with the hashtags #GrowWithGoogle and #EdTechTeam. Entries for today’s challenge will be accepted until 11:59 PM PST on Tuesday, October 9, 2018. We’ll select one winner from today’s entries to receive a $25 Amazon card* to help with classroom supplies. We’ll direct message you on Twitter if you’ve won! To get started, let’s take a sneak peek at the lessons. Google’s Applied Digital Skills curriculum is organized into lessons each lasting from 45 minutes up to 10 hours. There are currently 17 lessons designed for secondary students and 10 lessons for college and continuing education. However, we believe ALL of the lessons are appropriate for adult learners and can even be used to support teacher professional development! Use the filter at the top to view each category. 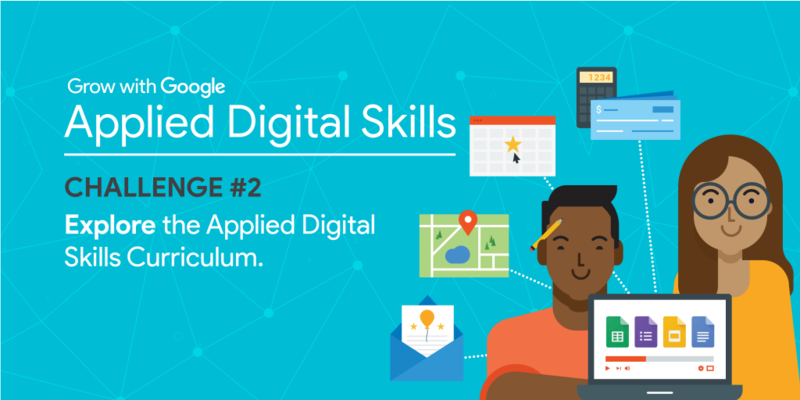 TIP: Google’s Applied Digital Skills curriculum was designed for learners from middle school to adults. However, we share examples of how it can successfully be used with upper elementary students in our free mini-email course — sign up today! Step-by-step videos with closed-captions and transcripts to support all learners. Also, each video can be downloaded, slowed down, sped up, or played repeatedly. Scaffolded learning activities built around Google for Education products and more. Comprehensive lesson plans with example projects, discussion topics, and rubrics that provide an easy to start solution. A lesson plan for teachers that has the lesson objectives, outline, skills covered, and more. If you are based in the United States, you can also filter by state standards. First, choose Middle and High School and then see if your state is listed. More standard alignments are coming soon! Do I have to use all of the curricula? The best feature of the curriculum is that teachers can pull out any of the lessons, or even activities within a lesson, at any time. TIP: If you’re pressed for time and want to get started with Applied Digital Skills, we recommend that you check out the lesson, Create a Presentation “All About a Topic.” It’s the shortest lesson and should take between 45-90 minutes in total. It fits within a class period or can be stretched out. Looking to build your students’ search, research, and communication skills? There’s a lesson for that! When applied to an English Language Arts class, students can use the Research and Develop a Topic lesson to properly cite sources, collaborate with others to test credibility and build proofed bibliographies for class essays or research projects. Another lesson that builds on these important, career preparation skills is Equal Access to Technology. In Mr. Brennan’s Middle School math class, students completed a Google Form to conduct a survey, then gathered the data into a Google Sheet and learned basic formulas like sum, average, standard deviation, range and more! To make it more visual, all their findings were translated to colorful graphs, plots and charts for analysis. Use these straight-from-the-classroom examples to encourage self-directed research that highlights each student’s creativity and critical thinking skills. Want to embed some coding skills into a practical project? It’s never too early to learn to code! Students grasp the basics and apply them to fun and relatable activities in the following lessons: Research and Develop a Topic, Guide to an Area, Plan and Budget and Create an Editing Tool with Programming. Do you want your students to practice important job and life skills while completing projects with a purpose? Many of the lessons prep Middle and High School students for life ahead. Aid seniors with their college search using the Research and Organize Information About College lesson. Or tie it into your current social studies class curriculum with the Create a Resume lesson. How? Students can create a resume for themselves and a historical figure to compare education, skills, and qualifications. Other relevant, real-life application lessons include Plan an Event, Guide to an Area and Pick the Next Box Office Hit. TIP: See more ways to integrate Applied Digital Skills in your subject area with our free, email mini-courses. Find your subject and sign up today! Use the rubrics in your classroom. I recommend projecting the example student project from the lesson and/or the lesson rubric as your student work through the activities. This practice helps students visualize and understand what they are working towards. I also recommend having students make copies of the rubrics to do peer and self-assessments. If you use Google Classroom, you can push the rubrics out as an assignment to your students and receive them all back in one place. The options are nearly endless! Once you find a lesson that works for your students, I suggest spending a few minutes reviewing the lesson plan, example student project, and the assessment rubric. Then, select a date that you will do tje lesson with your students. Don’t push this far out in the future otherwise, there’s a great chance that you won’t get to it. Thank you for participating and taking over #GrowWithGoogle and #EdTechTeam this week! Your enthusiasm is energizing! Let’s keep sharing with each other because that is the main goal of this week…sharing best practices! You’re Invited! Join our Panel Discussion. I invite you to join me tomorrow evening, Wednesday, October 10 @ 4:00 PM PST/7:00 PM EST for a panel discussion with a Googler from the Applied Digital Skills team and teachers who are implementing and remixing Applied Digital Skills in their own classroom! Sign up for free. After we wrap, I’ll be giving away some fun prizes for those who join us live. Hope to see you there!